There are thousands of wonderful edible wild plants where I live here in Indiana but wild sources of starches can be a bit tricky to come by. Proteins, fruits, and vegetables are easy to find but the starches, not so much. Acorns can help fill the gap. 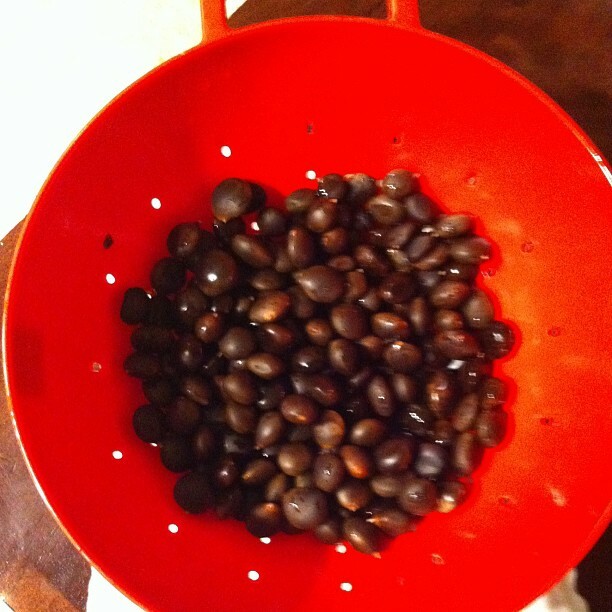 If you are interested in learning about the process, I recently had an article published in the Nov/Dec issue of GRIT magazine on harvesting Acorns for food that covers this process in detail. The digital version is now available via the link is below. I’d love to hear your feedback and your own experiences using this amazing and versatile nut! For years I passed up stinging nettles when I would be out gathering spring greens. Though they are quite plentiful in my area, I always let them be. Shuddering from memories of my childhood summers, running through the woods and coming home with puffy, red, swollen legs from stings of adult nettle plants, I assumed they were just too much work to harvest and render them edible. Trying not to get stung and probably failing while harvesting, then taking the risk of rendering the stingers innate through cooking which may or may not have worked just seemed so epic. I thought, “why go through this when there are so many other greens available? Very few greens are really that great anyway, why should I armor myself and risk dermatitis for boring leafy greens when there are tons of exciting wild foods around, like garlic mustard, mints, wild carrots and parsnips? Why not just submit to millennia of evolution and let the stinging nettle’s natural defenses do what they’re designed to do and keep it from being eaten? Why challenge evolution! ?” Well, because stinging nettles are delicious, that’s why. Once I took the plunge, I was glad I did. Never had I encountered such a rich, hearty vegetable that had no trace of bitterness yet such a bold and robust flavor. Though there are many plants that arbitrarily resemble stinging nettles, it is easy to positively identify them apart from look-alikes. A most distinguishing feature of true nettles are the square stalks that have a deep groove that runs the length of it on each corner. I know of no other plant with such distinct stalks. True stinging nettles have leaves with severely toothed margins and, of course… there are the stingers. Stingers will be prevalent on the stalks, petioles, and, to a lesser degree, the underside of the leaves. When gathering nettles I have just resigned myself to getting stung. I have just come to embrace this and have moved past it. The prime stage to gather nettles is in the early spring when the plants are quite young and, subsequently so are their stingers. So, any stings I do get are generally pretty mild and don’t last more than a few seconds. I usually wear gardening gloves and have found I still get stung, even through the material. Still, I get stung much less wearing gloves, so I prefer to take them along when seeking nettles. Still, if I run across a patch of them and don’t have a pair of gloves with me, I am by no means passing up the harvest. The stings from young plants are just not very serious and can be mostly avoided with careful handling. Just cut the stalk with a medium blade as low as you can and handle the plant by the tops of the leaves when possible. Since the stingers are on the underside, you won’t get stung from contact with the tops of the leaves. In this young stage you can even eat the leaves raw if you roll the leaf up where the underside is inward. Between the pressure from the leaf itself and from your teeth, the stingers are crushed and rendered innate. Cooking and dehydration also kills the stingers, so whether you saute them, cook em up like turnip greens, make soup or tea, you don’t have to worry about getting stung while eating them. They’ll be as benign as spinach, but much tastier. Nettles will be a deep green color but may also have purple running through them, especially on the underside. All of the stinging nettles I have encountered in my area have this trait. The stinging nettle is a nutritional powerhouse, which is most notably demonstrated by its rich flavor and satisfying heartiness. They are very high in iron, calcium and vitamin D, and contain respectable amounts of vitamins A, C and B-complex. With wild plants it is really hard to say specifically how much of each nutrient would be found in a specific specimen. This could vary significantly due to the specific environmental factors where they are found, such as the soil type, amount of sunlight, nearby flora and fauna, etc. My favorite way to eat nettles is to simply saute the greens in a little sunflower oil and butter, then lightly salt and pepper them. If the wild garlic mustard has lost its bitterness by the time I gather my nettles, then it makes a great addition to the pan. If not, a little minced garlic will do the trick. I plan to post a nettle soup recipe to the recipe page here soon. Stay tuned for that and please feel free to share your own experience too! I’d love to hear your stinging nettle stories, thoughts, recipes, memories or anything that comes to mind. A friend of mine and her husband recently acquired some acreage in rural Indiana and set out on the great adventure of discovering the bounty of the natural landscape of the land of which they were now the stewards. 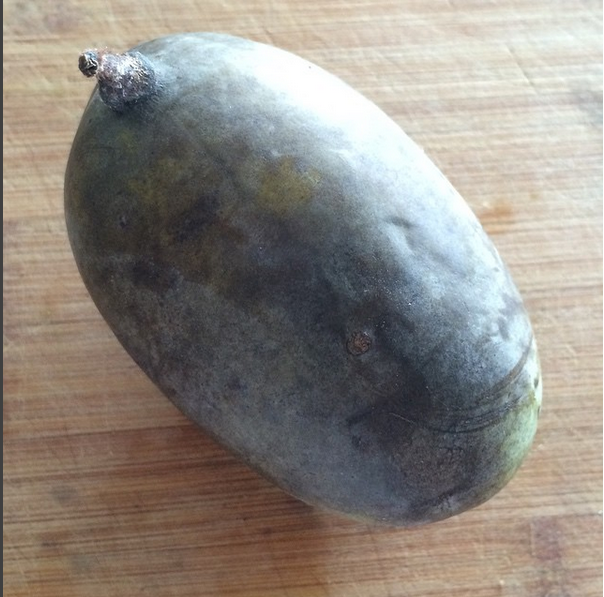 They’d heard of paw paws, as I’m sure every Hoosier has, and even knew some of their nicknames such as “Indiana banana,” but had never seen them nor had ever had the opportunity to taste them. When they ran across a small grove of several Paw paw trees at the edge of their woods they were elated. When they only found a few measly fruits out of all of the trees in the grove they were a bit let down. She sent me an email asking if I knew anything about paw paws… and I thought… heh… Yeah… I know a bit about Paw paws. She asked a very simple question and I wrote her an essay in return. Below you will find our email correspondence and a few blurry cell phone pictures. Congratulations on your new property! Yes, I do indeed have some experience with Paw Paws and yes I would love to have some, please! 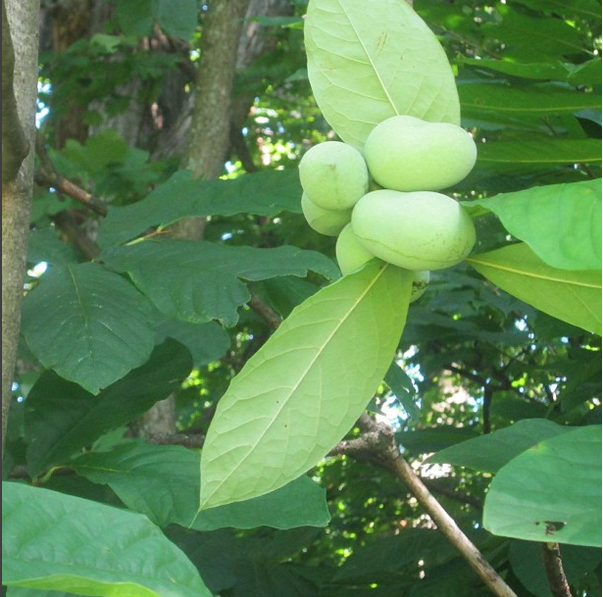 Botanically Paw paws are Asimina triloba and are the largest indigenous fruit in North America. 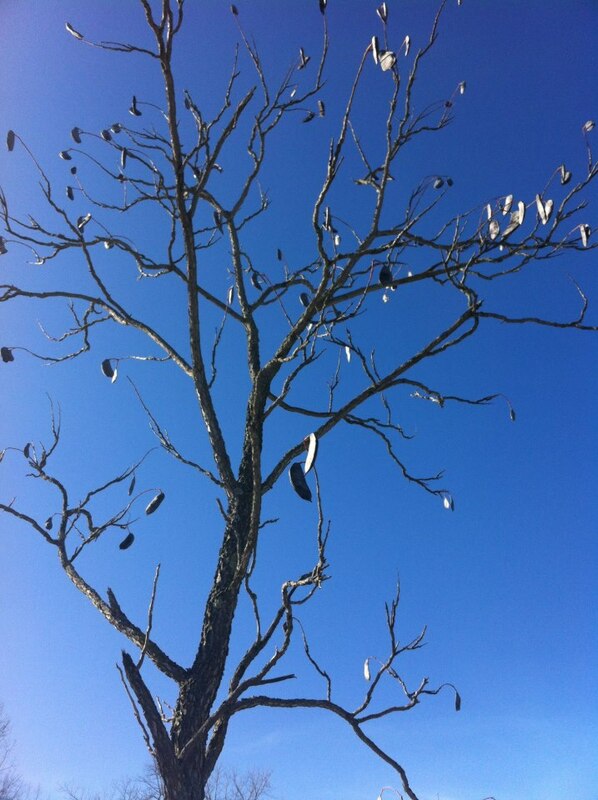 Paw paw trees are related to magnolias, which you can observe when the tree is in bloom. It has magnolia-esqe blossoms that are very dark in color. However, many do not produce much fruit if any at all. The flowers give off an unpleasant smell to which most pollinating insects are not attracted. 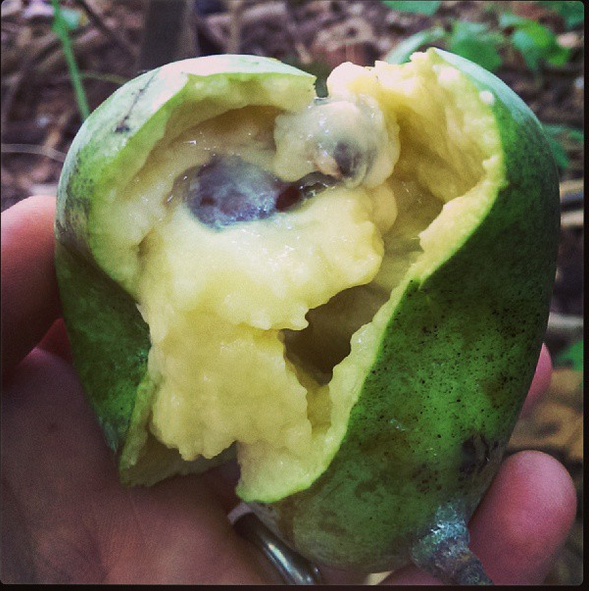 I have been in many seemingly healthy paw paw groves in peak season, surrounded by hundreds of the trees and found only a couple of fruits. I have also found groves where some trees had branches so full of fruit that a small shake of the thin trunk sent a barrage of mushy green grenades raining down all around me even though trees right next to it were completely barren. This is especially strange because they tend to reproduce asexually from root suckers like apple trees do, meaning most of the trees in a grove should be genetically identical. They also tend to do better in partial sun but they are relatively short trees and Indiana forests tend to be full of oak, hickory and walnut trees that will eventually fully shade them. To make a long story short, I wouldn’t be surprised if yours don’t produce very well, as that is very common. I also wouldn’t be surprised if each tree’s yield varied greatly from year to year. Also, I’d say that the harvest season is actually near the end. I have found the bulk of the paw paws that I have collected around here in mid-late august during the peak of the heat. I have been too busy to get out and check my spots this year, but I would imagine that the early cool off would only speed up the end of the season. As far as the flavor goes, they’re… unique. I love them, my wife hates them. They’re green when you’d typically harvest them but like bananas they will ripen on the counter in a few days. They also darken like bananas and become kind of unattractive when ready, sort of a blotchy greyish blackish. The yellowish fruit pulp inside is very mushy which is where it gets its nickname of “Custard Apple.” It really does have a consistency quite akin to custard. 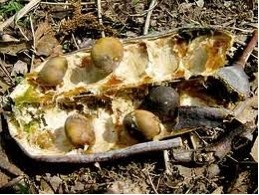 There are a lot of seeds inside each fruit, so I either eat paw paws raw and spit the seeds or strain the pulp through a jelly bag or cheese cloth to separate the seeds. The flavor is very tropical with hints of mango and papaya, but with a je ne sais quoi all its own. Fresh paw paw pulp over a quality vanilla ice cream is just about the closest thing to heaven that I have ever experienced. Feel free to let me know if you discover anything else of interest that you’d like to know about out there on your property. There are probably hundreds of great wild fruits, nuts, vegetables and mushrooms out there on your place. If you pay attention you’ll be discovering them for years to come. 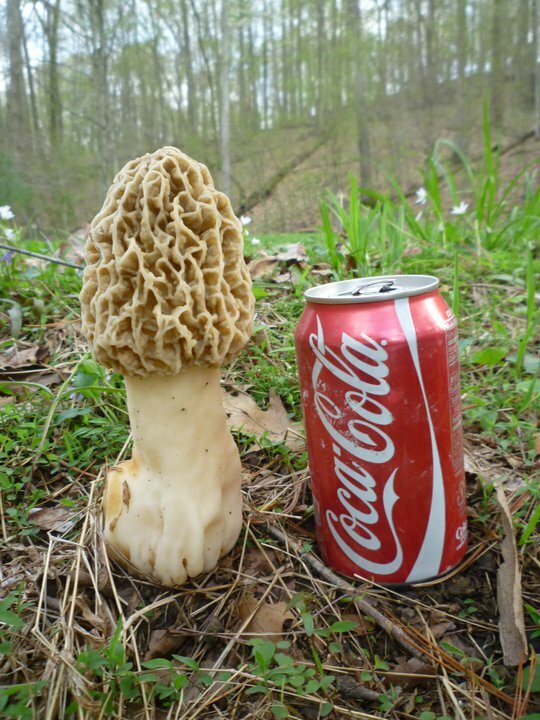 I have spent countless hours in the woods in search of this elusive beast we call the Morel mushroom. The coveted creme de la creme of wild fungi that seems to motivate people, who do not consider themselves foragers, to scour the woods with a fine toothed comb every spring. Maybe it’s the fact that they are hard to find that presents people an alluring challenge. Maybe its the fact that they can fetch a whopping $50 per pound at a local farmer’s market. Whatever the reason, one thing is clear. When the first warm weather hits in spring, Hoosiers take to the woods. Most, like myself, will have marginal, if any, success. I became enamored with foraging for many different types of wild fruits, vegetables, nuts, greens, and more for the simple reason that I got tired of leaving the woods empty handed after hours of unsuccessful searching for Morels. This isn’t just my own sad story. Many, if not most, of those folks that give Morel foraging a go will experience this disappointment. Yet we keep going back thinking our luck will change. Sometimes it does, but not always for the better. 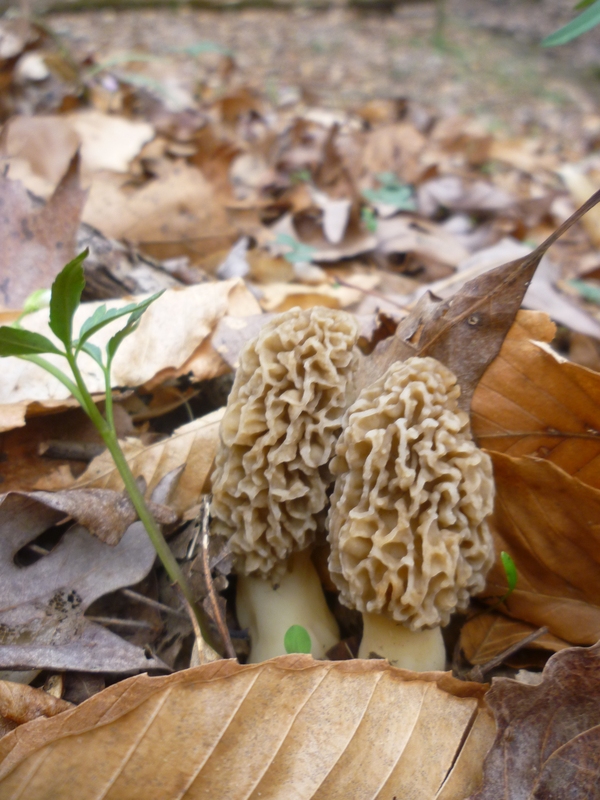 There is a lot of conflicting information about when, where and how to find Morels. I have often found nice sections of woods with, what would seem to be, perfect conditions but no Morels to be found. Even places were there were dozens the year before may not produce a single mushroom under comparable conditions. Really good morel mushroom hunters are just as fascinating, mysterious and hard to find as the coveted prize they seek. And just like the morel, they will rarely ever reveal any of their secrets. So just like a good Morel honey hole, when you find a good mushroom hunter, you keep going back to him. To me that’s Joe Steele. When Morel season comes in his Facebook wall becomes inundated with picture proof his Morchellan trophies. When you ask locals for foraging advice they just shrug and say, “you oughtta ask Joe.” Whether the season comes in right on time or a month early like it did in 2012, you can bet he’ll have found the first ones of the season and you can likewise bet that, when the weather warms up, he’ll claim the last ones too. After promising that I wouldn’t make him take me mushroom hunting or make him show me any secret spots, I finally got him to crack and start talking about Morel hunting, how he approaches it and what it means to him. Warning: the following interview acknowledges the existence of genitalia and turtle orgies. The Weed Eater: So, why did you start foraging mushrooms? 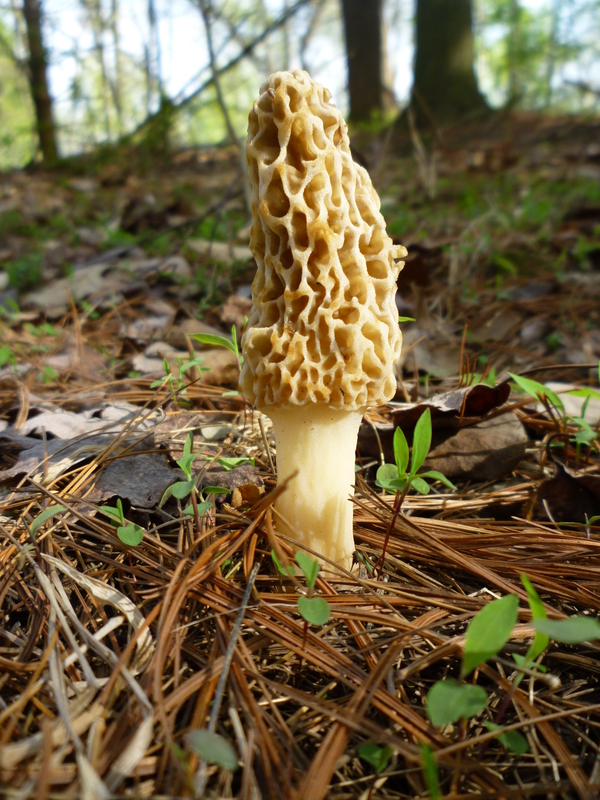 Joe: Some of my earliest memories are of hunting morels on my family’s property in Brown County, Indiana. My grandfather was born and raised in the area that is now Hoover Road and we would forage as well as hunt squirrels there. So, I started just to spend time with my dad and his dad and from there an addictive hobby was born. The Weed Eater: Do you still hunt? Got any good recipes to share? Joe: I haven’t hunted since high school. I got a great shot on a doe that year from a ways off and hit it just above the heart breaking its back. Walking up to a struggling, suffering animal spouting blood and breath through the hole really turned me off. I finished it off with a slug in the head, but I lost my taste for hunting then. Now, the last few years I have seriously considered getting back into it. 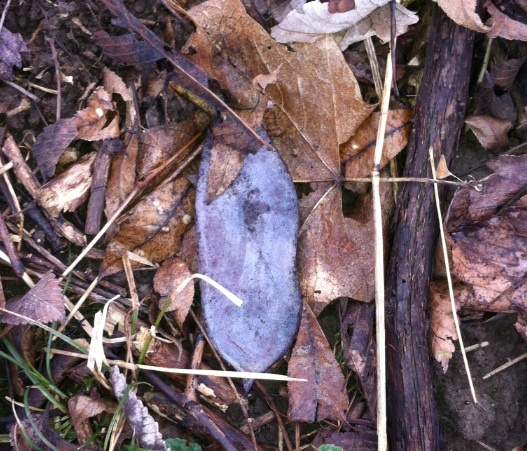 The Weed Eater: What is your earliest memory of eating a wild food? Joe: My earliest memory of eating wild food would be eating clover in the yard. I have no idea on the technical terms of any of this, but before clovers would bloom, I would love to eat the shoots. They were tart and delicious. In my childhood yard, we had three varieties of apple trees, a cherry tree and a huge garden. So though it wasn’t exactly wild food, my yard was always a snack bar. The Weed Eater: Yeah, I used to eat the little yellow flowers from sorrel plants I found in the school yard and at home. They were addictively tangy. So, just morels or do you eat any other wild foods? Joe: During morel season, my wife and kids collect fiddleheads and wild onions. My wife sautéed them and served them as a side for our morel covered steaks. I also make homemade wine and around the fourth of July, there are multiple berry patches that give me gallons and gallons of blackberries and raspberries. Many of these patches, I located while morel hunting in the spring. I have collected chanterelles, but have not eaten them yet. 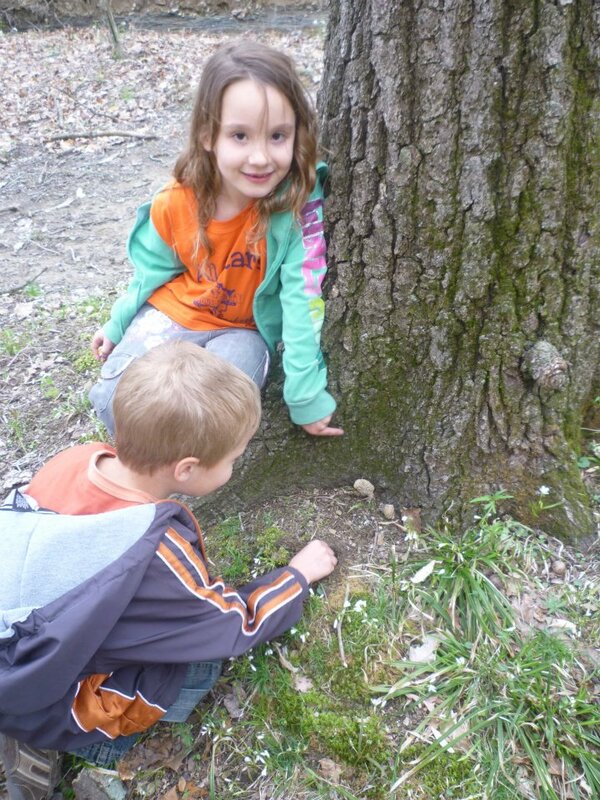 The Weed Eater: My kids love to go on berry picks with me but I can’t seem to get them interested in morel hunting. Is this something that your children are involved in? If so, what did you do to spark that interest and / or how did they make their own personal connection with morel hunting or even nature at large? Joe: My kids love to go with me, but more for the fun in the woods. They climb trees, make forts, pick flowers and just enjoy nature. I usually take them on the easy hikes that lead to a known successful tree. That way we can hike, have fun, then I can say, “Now start looking, I think we are close to them.” Then they have that feeling of success when they trip over one! Tiny, but beautiful… the mushrooms too. 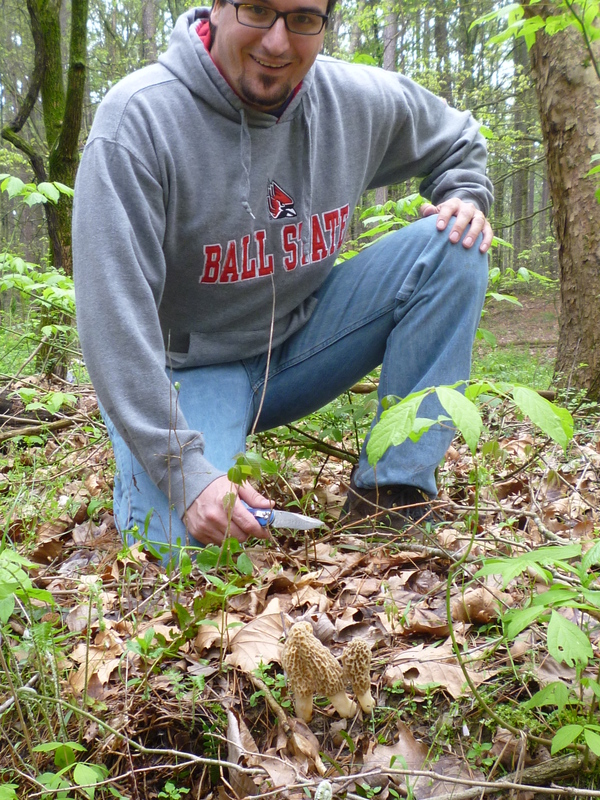 The Weed Eater: Do you look for any certain types of conditions to search for morels? Type of terrain, canopy, soil conditions, etc? Once you start seeing dogwoods bloom, dandelions in the yard and mayapples in the woods, it’s time to hunt. I look for the weather. The ground temperature needs to be at or above 50 degrees for a few days in a row. Once you have that, go look. Last year, 2012, we had four days of 80+ heat the second week of March. For the first time, I found big yellers in March. Traditionally, for me, I find the first blacks around April Fool’s Day. Then that first week of April, I’m looking for blacks and early grays. Mid April, it is mainly greys, some big ole blacks and some early yellers. The end of April and the first week of May is when it is hot and I try to be out every day. Into May, you can only hope to find the random HUGE monster yeller. Like I mentioned, ground temp sets it off, so early in the season, look on ridges and south-east facing hillsides, as these areas get the southern sun. 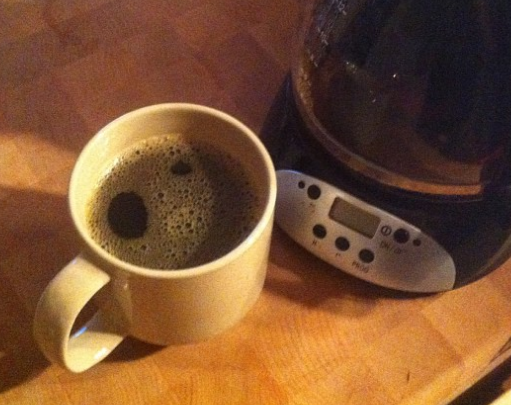 An easy way to figure it out is to go foraging early in the morning. The area covered in light has the best chance of early morels. Once season gets going, you’re going to find them in valleys next to streams. Towards the end, go down further in hard to reach valleys and in pine thickets, as they are the coolest places. As for trees, you need to study in the off season. If you do not know your trees, then you could wander in the woods your whole life and never find a morel. I still spend many hours in the woods with nothing to show for it… You will have to identify trees by their bark as there is very little canopy early in the season. Dead elms are the favorite of morels. Other trees that have a great relationship with morels are: tulip poplar, ash and old apple orchards. Morchella are an underground web and the mushroom is merely the fruit on the limb. I don’t know the technical relationship, but it is my understanding that the aforementioned trees have something in them that the fungi can live symbiotically helping each other break down nutrients. The Weed Eater: What are some things that foragers can do to help future harvests? 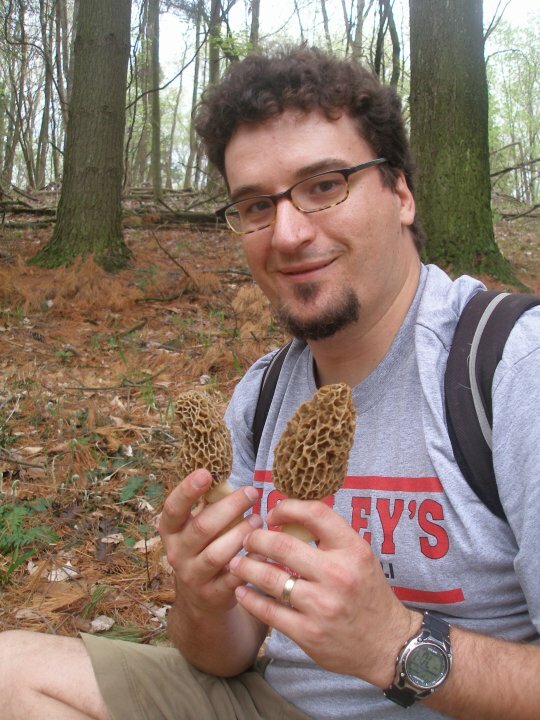 Joe: As I mentioned, Morchella are an underground fungus and the morels are simply the fruit on the limb. If you pull the morel from the ground, there is great chance you will break that limb, thus cutting off what could be feet or hundreds of yards of the fungi. 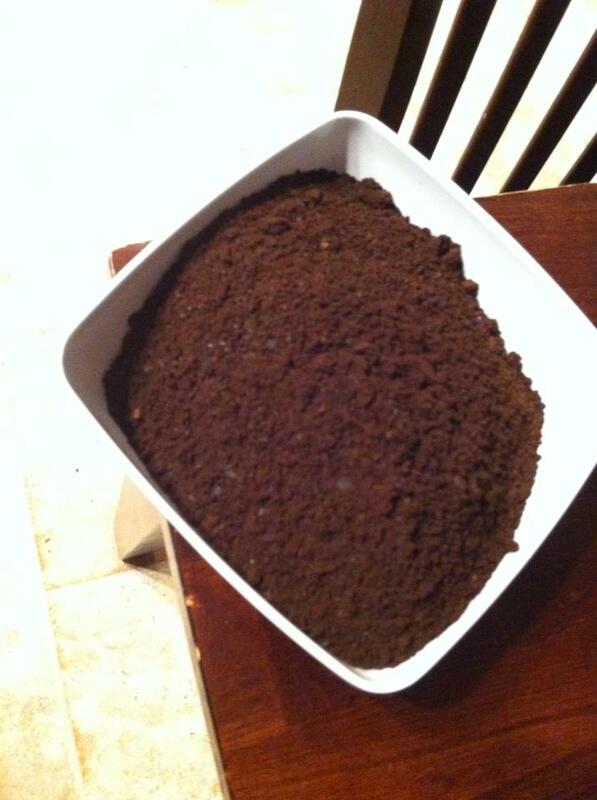 I have always been taught to cut them off at the base, as this will not damage the extremities. The logic goes that morels being the fruit, means they bear the spores. If you find a morel late in its life, chances are the spores have been spread. But chances are you will find morels in all stages of their life, so it is important to carry them out of the woods with a mesh bag or onion sack as this allows any spores still with the morels to spread and fall as you are walking around. For years, I used bread sacks or Wal-Mart bags. I have gone to many honey holes every year of my life and still can return the next year and will find them, regardless of how I carry them out. And spreading the spores has never led me to see new places to find morels. I’ve soaked my morels and poured the water in the same spot and have never had morels grow there. The Weed Eater: Do you feel there is any spiritual connection between you and mushroom foraging? Joe: It is hard not to feel a spiritual connection. For one, it is a hobby I started with my father and grandfather. I found my first morels with them. When I am getting excited for the season, it is hard not to think about those two men. Plus, any time I spend in the woods, I feel a spiritual connection. Every season I have seen something remarkable, including huge buck skulls, bald eagles, fossils, glorious geodes, rare ducks, turtle orgies, puddles full of tadpoles, whistling pines, suicidal squirrels, and many others I can’t conjure. The woods are quiet and many places I go my cell phone won’t work, so it’s just me and God’s barely touched earth. Then add to that, the rarity of finding a mess of morels. You hike and hike forever, then seemingly out of no where for no good reason, you walk upon a honey hole. It gives me chills. The Weed Eater: Morel mushroom foraging is extremely popular around here. Even though there are thousands of wild edibles in our region, morels seem to carry a mystique that brings people to the woods consistently every year where other wild plants do not. What do you think is the difference? Are they just that tasty or is it something deeper? Joe: For me, it is the difficulty and rarity of morels that is so attractive. Morels are only available for a very small window in early spring. Once they arrive, they are only fresh for less than a week. And they are scarce. There are 2000 acres behind my house that I often search and I have only found three honey holes of morels. Each of these spots are smaller than an in-ground pool. It is a huge challenge, both mentally and physically to find them. Also, Morels are easily distinguishable to other mushrooms. There is little chance my kid will ever pick another type of mushroom and mistake it for a morel. (Yes, Verpas, but they aren’t so bad.) So I think that lends to its popularity. Add to that the great taste and the challenge, and I think that is why it is so popular. For me, this is the year I start finding ginseng! The Weed Eater: You mentioned verpas. People sometimes call this the false morel. My dad and his redneck buddies called them peckerheads. (not so ironically Verpa means erection in Latin). Some regard it as edible and some do not. I remember eating them as a kid and making no real distinction between them and morels. What are your thoughts on these mushrooms? Do you ever eat them? Joe: I think Verpas are different than peckerheads, or their PC name, half-frees. Verpas have a cap that is like an umbrella and connect at the stem instead of being hollow like in morels. Peckerheads are morels that are just 90% shaft with a small head. They are almost always blacks, where verpas can come in differing shades. (I could be totally wrong, but that is how I have seen it.) I don’t like peckerheads. They dry out quickly and easily disintegrate when handling. Plus, the cap is the tasty part and with peckerheads, that is what they are at a loss for. The Weed Eater: What is the best meal you’ve ever eaten and or prepared using morels? Joe: The start of my fishing season usually coincides with the tail end of morel season, mid to early May. As the season comes to a close all that is left in the woods are the MONSTER yellers. There was a year I thought morels were done so I went bass fishing. I caught a nice mess, then decided to hit one last valley and hit a lick. Got home, breaded and fried everything in the same cast iron skillet. I may have been half drunk from a day of fishing, but that was the best morel meal I have had. The Weed Eater: Any other recipes or tricks we should try? Joe: My wife loves to simply sauté morels in butter with a little salt and pepper and pour them over her steaks. I love them cleaned, (cut down the middle to release bugs and dirt), dipped in a whipped egg bath, then rolled in Andy’s Cajun fish breading and then deep fried. The big yellers stay moist on the inside and then awesomely crunchy on the outside. I have buddies who put them in their vegetable stew stock or make cream of morel soup. I’m simple and like em fried! Joe Steele is a hell of an impressive mushroom hunter. I am really grateful that he took the time to answer my questions with such enthusiasm, especially after I promised him I was buying the brews down at the Power House Brewing Company and never made good… but I am seriously going to do that soon. I learned a lot from his answers and, though I missed out on Morels this year, I’m anticipating a better season next spring using his tips. I’ll also be quite interested in hearing how his ginseng hunts go! I am a drive by asparagus forager. I might make my way to gather it up on foot, but I typically spot it from the car, usually adult plants and almost always way out of season. My big brother, Kyle, taught me this technique and it has proven effective time and again. Here in southern Indiana, wild asparagus (Asparagus officinalis) is much easier to spot when it’s the size of a small shrub and loaded down with conspicuous red berries. It is especially easy to spot when there is snow on the ground. Unfortunately this is not a good time to harvest it for eating. Asparagus should be harvested in the spring when the shoots are under 12″ tall. 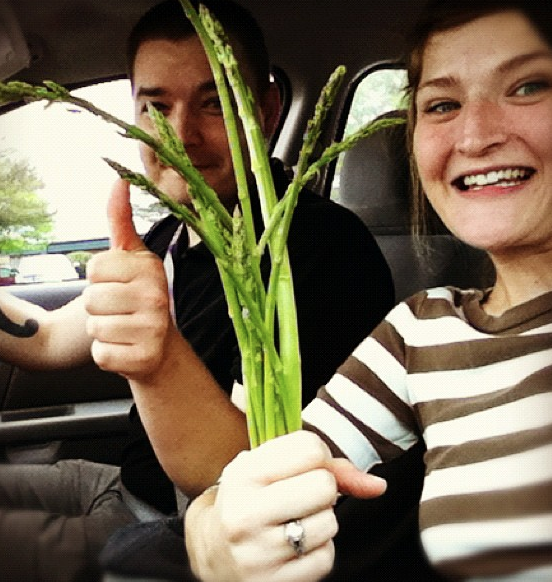 However, the picture shown here shows my lovely wife and I with a batch of fresh asparagus that we harvested near my dad’s place in late September 2012. I can only assume that fall’s mild weather and rainy conditions coupled with a fresh mow caused our favorite asparagus spot to produce another crop for us. Because of this I am considering trying to force a fall asparagus season in several spots this year as well by cutting down a small percentage of the adult stalks and spreading the seeds.